Augmented Reality has NAFA looked better! 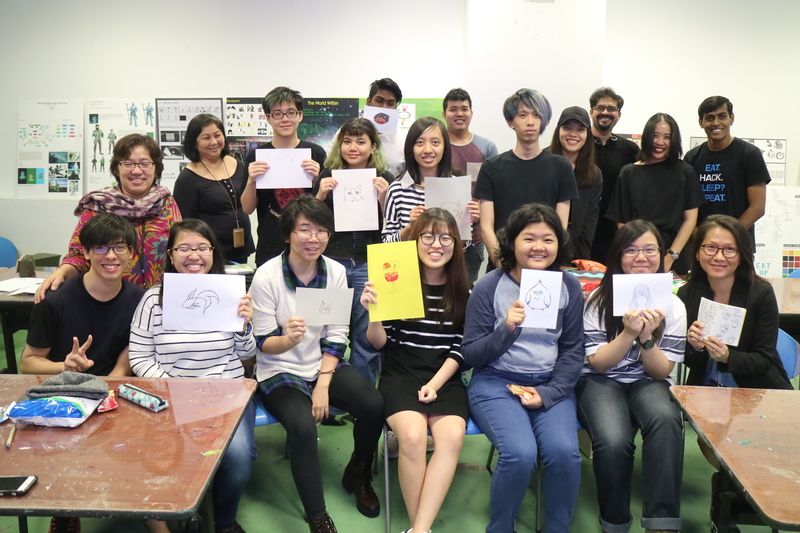 Storytellers’ Kitchen goes to Nanyang Academy of Fine Arts. 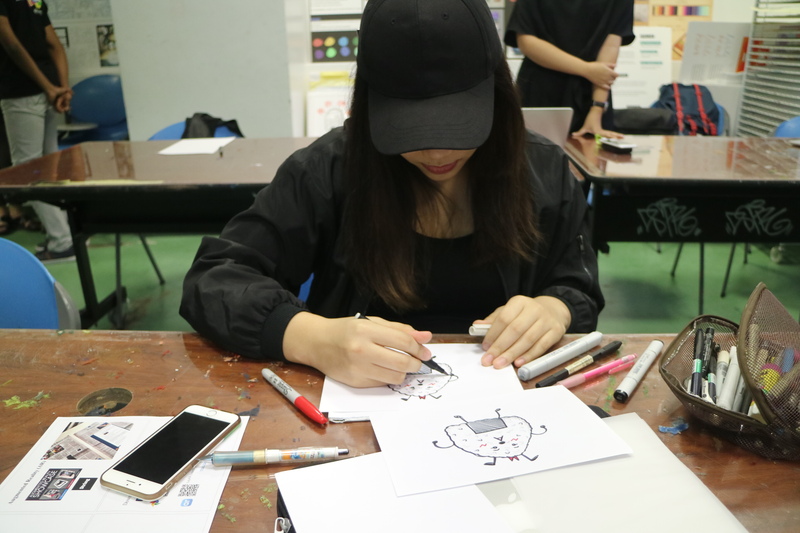 Last month, Storytellers’ Kitchen took the Augmented Reality workshop to the students of NAFA. Students would learn how to take their illustrations and use a few apps to convert them into nifty AR targets that came to life! Sounds like a fun way to spend a Friday afternoon, no? Unlike our previous workshop participants, the students were skilled illustrators and had some experience with 2D animation. They were all enrolled in a course called ‘Illustration Design With Animation’. One of their lecturers had attended our AR session at AFCC last year, and thought they would benefit from this workshop (shoutout to Peh Mei Lian for thinking of us of us!). As a result, the students had no trouble coming up with an idea of a simple drawing that could be built upon. For this particular workshop, the finished product has more ‘wow’ if you’re able to incorporate storytelling elements from the very beginning. Indeed, we found that the most delightful creations we’ve seen use the illustrations to take us on a (short) journey, instead of merely showcasing AR for AR’s sake. As you can see, we had a lot of successes at NAFA. The illustration game was strong with these folks, and their ease with technology allowed them to get a handle of the process quite quickly, spending most of their time to perfect their creations. We love that! While our Chief Geek Saad conducted the session, other members of our team hung around to help the students with any questions or problems that came up along the way. Storytellers’ Kitchen is just about as experimental as it gets, so if you’ve attended one of our sessions and have feedback for us, we welcome it with open arms! We also love new ideas for collaborations. If you’d like to run a Storytellers’ Kitchen session in our space, talk to us. Email lily@tusitalabooks.com and we’ll get back to you as soon as we can! © Tusitala (RLS) Pte Ltd. All rights reserved. Powered by WordPress. Our values are the daily beat to which we jive. Don’t let red-tape trump creative freedom. Create design that integrates form and function. Care about each other, and the entirety of who we are. Keep inclusivity and collaboration central to our process. Tusitala was born in 2010, with a focus on telling transmedia stories. We’re based in Singapore, perfectly poised to represent the breadth and depth of Asian content available in the region. With the world increasingly looking towards Asian stories, we’re both excited and proud to be where we are! The name Tusitala harks to an island in Samoa, where author Robert Louis Stevenson spent the last years of his life. The locals of the island fondly nicknamed him Tusitala, which means storyteller. In our work, we embody the essence of a storyteller: using different mediums and techniques to deliver a powerful message to our audiences. Only, we take it a step further by introducing the exciting potential of technology. Our logo is a kitsune – nine-tailed fox, native to Asian folklore and legend. In Chinese, Japanese and Korean folktales, the kitsune is an enchanted animal – magnetic, intelligent, powerful, and able to take human form. From the complexity of the symbolism, we derive simple principles that we stand for – potency, wisdom and creative rebellion. Email your resume, github url, OS preferece, expected salary to hr@tusi.sg.